Humanity is being threatened by a race of aliens called the Scryve, and we need you to stop them from wiping us off the galactic map. We’re giving you a state-of-the-art interstellar starship to accomplish this - try not to break it. It was expensive. Save humanity, Captain, at all costs and by any means necessary. You’re our best hope. ...boy, are we in trouble. Star Control: Origins is a huge, living universe just waiting to be explored! Throughout the game’s adventure mode, you’ll encounter dozens of unique alien races in your mission to uncover the secrets of the Scryve. You’ll get to choose how to interact with them - whether you solve their problems (or create more!) is entirely up to you. You’ll battle against strange creatures and robotic drones, gather resources, and avoid hazards as you explore thousands of unique planets across hundreds of stars. Trade resources, upgrade your lander, or recruit new ships for your fleet at one of the many starbases strewn throughout the galaxy. Make friends (or enemies!) through hundreds of quests and choose the path of your adventure as you work to save humanity from some of the terrifying monsters that lurk out in deep space. Battle against over 100 unique ships and recruit powerful allies for your fleet as you progress your story and make a name for yourself on the galactic scene. 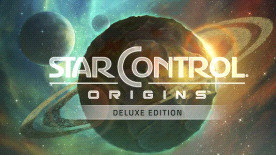 This special deluxe edition includes the game and the Star Control: Origins Original Soundtrack. With over 40 compositions from renowned composers Mason Fisher (Age of Wonders, Eye of the Beholder III: Assault on Myth Drannor) and Riku Nuottajärvi (Star Control II: The Ur-Quan Masters), the soundtrack features several energetic and emotional songs that encompass the spirit of Star Control: Origins perfectly. Gear up your lander and journey across hundreds of solar systems and thousands of planets! Travel to different worlds to complete quests, collect resources, and fight unusual creatures. Some worlds you encounter may have active volcanoes, or be shrouded in toxic gasses. Others might have dangerous sentry robots guarding hidden bases, or terrifying whirlwinds. Equip your lander with upgrades in order to survive your exploring. Travel to distant stars and make friends (or enemies, we're not terribly picky) with the aliens living there through unique dialogue choices and quests. Every decision you make may have far-reaching ramifications. How you accomplish your mission is entirely up to you - be a hero, or be a villain. The situation is desperate. Face down the ominous threat of the Scryve Empire and stop them from wiping Earth off the galactic map. How you go about that is entirely up to you. The Scryve already have several ward species who may or may not help you fight back. It will be up to you to convince them to help...one way or another. Star Control has given you top of the line technology so that you can make adjustments and outfit your ship any way you like in order to complete missions. From shiny new hyperdrives, to a higher cargo or fuel capacity, you will be able to customize your ship to fit the way you play. Lander upgrades are also important so you can survive forays onto dangerous worlds. Engage in exciting ship-on-ship combat as you take down dangerous aliens to complete your mission. Or, you can run away, but that's not nearly as much fun. Outside of the main adventure mode, the Fleet Battles mode in the game will let you face off against other players online or locally. Assemble your fleet from an assortment of provided ships (or customize your own!) and get ready to rumble! Ranked play could earn you a spot on the worldwide leader boards and some bragging rights. Customize your very own ships to use in fleet battles or in special quests that you can write. Outfit your ships with weapons, defenses, and engines, then share them online using the Steam Workshop! You can make your own buildings and worlds to use in your very own questlines. The Adventure Studio lets you create your own alien races and dialogue for a unique experience and brand new exciting adventures. Hyperspace travel theme, planetary exploration themes, alien leader themes, and much more await you in a soundtrack that spans over 2 hours long! Download the music and take it with you anywhere you go to make even the most mundane tasks epic and exciting.